Place flour, almond meal and baking powder into a large mixing bowl and mix with a wooden spoon until there are no lumps. In a separate bowl or jug, lightly beat the eggs then add the almond milk and maple syrup, mixing together until combined. Pour into the dry mix and whisk until smooth. Heat your frypan over a medium heat, adding a little coconut oil (½ tsp.) for each pancake cooked. Pour/spoon in enough batter to make approx. 10cm circle, waiting until bubbles appear before flipping and cooking the other side. About 2 minutes each side. Place on a separate plate and repeat this process until all the batter is cooked. 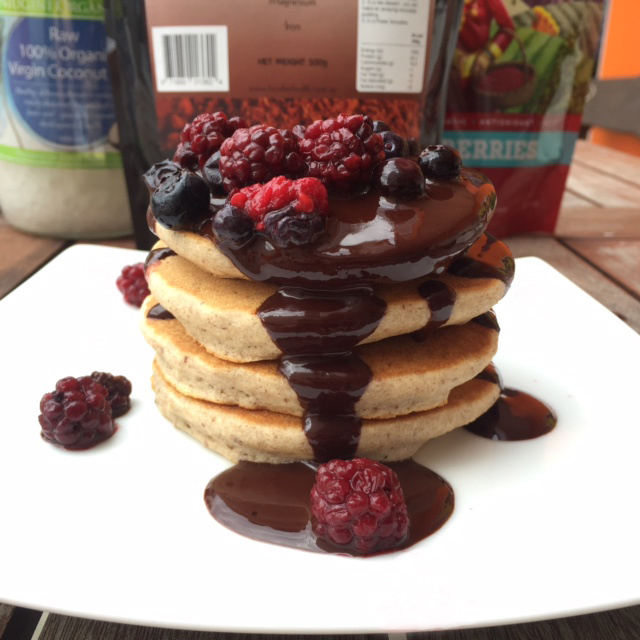 Serve with fresh or thawed frozen berries and a drizzle of raw chocolate sauce. You will get about 6 larger pancakes, or if you cook them ½ the size, you’ll get 12 smaller ones. Simply mix the coconut oil with the raw cacao until well combined. Add the maple syrup, stirring until smooth and glossy.